One of the big downsides to Istanbul’s otherwise great food scene is the lack of a credible Mexican option. We’re not asking for anything special, just a place that serves simple, tasty tacos or burritos. 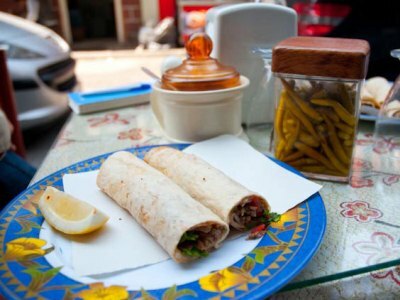 But when the craving for Mexican gets strong, we don’t despair; we just head down to the waterside neighborhood of Karaköy, home to Beşaltı Kirvem Tantuni, a hole-in-the-wall (literally) spot whose food and atmosphere remind us of the tiny taquerías in Mexico and the United States that we miss so much. Beşaltı Kirvem is located in a ruined former Orthodox church in the heart of the old port district, an area still packed with import/export offices and frequented by stevedores waiting for work, whose streets have lately become the place for architecture and design offices. But the chic cafés and art galleries that have followed the buzz don’t seem to have threatened this old-school joint’s business. In fact, the recent gentrification of Karaköy has only made it harder to find a stool out front during lunchtime.